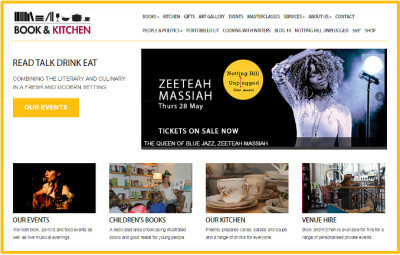 At Book and Kitchen, we do many things, one of which is building, designing and managing websites. We built our own website, as well as many others for local businesses in our area, as well as street and community sites. Our focus is for small to medium size websites that run anywhere from 5 to 50 pages. So if you are looking to increase your online presence, whether from a basic site to something more interactive including e-commerce or a shop then we can help. New websites will be mobile/tablet-responsive. Customised plugins such as maps, event calendars, galleries etc. Please note that we expect clients to provide all starting text content (including copy and images). * Please note that cost does not include domain purchase and hosting costs. We are happy to recommend suppliers that we use for our websites. This cost is based on a fast turnaround and approval process with limited revisions and no additional requests. Costs for e-commerce or more complex websites are much more time intensive and will be reflected in a higher cost.